Sorry, DaVinci Ascent All-Inclusive Vaporizer Kit has been discontinued. The Da Vinci Ascent All Inclusive Kit comes at a large discount, and includes the Da Vinci Ascent personal vaporizer including extra screens, a high-quality grinder by Aerospaced, a glass set to complement the Da Vinci Ascent (or to act as replacements if you happen to break the original glass pieces), and some handy storage jars for either dry herb, waxes, or oils. 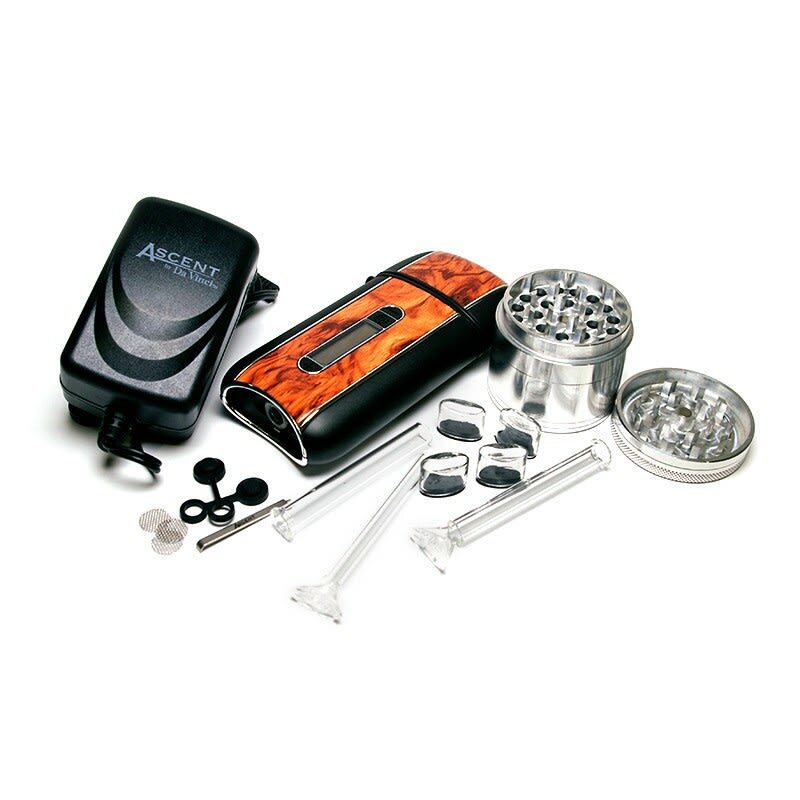 Da Vinci Ascent All-Inclusive Vaporizer Kit - ONLINE ONLY! Looking to buy a great quality, high performance herbal vaporizer setup that comes complete with all necessary accessories to make your experience perfect, and make device maintenance easy? Look no further. The Da Vinci Ascent All Inclusive Kit comes at a large discount, and includes the Da Vinci Ascent personal vaporizer including extra screens, a high-quality grinder by Aerospaced, a glass set to complement the Da Vinci Ascent (or to act as replacements if you happen to break the original glass pieces), and some handy storage jars for either dry herb, waxes, or oils. This is truly a high quality kit at a very affordable price. The Aerospaced 4 Piece Grinder and Sifter is 2 inches in diameter, and works great for dry herbs. It also has a collection tray to save some of the good stuff for later. The Da Vinci series of vaporizers are very popular for dry herb, wax, and oil materials and are designed for personal, therapeutic use. The Da Vinci Ascent is available in several different styles and features an attractive glass stem. These are powerful, pocket sized, fully rechargeable portable vaporizers that will give you a smooth, discreet vapor. The Da Vinci Ascent also features manually adjustable temperature so you can customize the warmth and volume of vapor coming from your device. The Da Vinci Ascent has a digital display and a glass air path, and is in general a very clean and reliable device. I am very impressed with the quality of this product! It has a relatively fast heat up time and the battery lasted a lot Bolger than I had expected. I love that you can adjust the temperature on this vape instead just three standard settings, this allows me to get the most comfortable vape for me! I also love the ceramic oven in the bottom, it offers even heating of product and has no metal after taste in the vapor. Plus the glass the tubes are super easy to clean!! What a great product!